She spoke of how disappointments can sometimes be blessings, adding that surely she wouldn’t have been where she is today if she had won the competition. 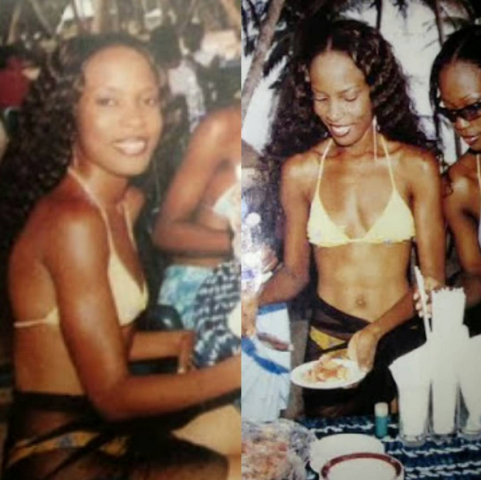 These are photos of me at a beach party organized for contestants of the 2003 Miss Nigeria pageant. I bet some of you didn’t know I once contested? I told y’all I was a hustler back in the day..lol. Anyway, I desperately wanted to win the pageant because I believed I could use the platform to achieve my other dreams. I imagined all the possibilities, starting an NGO, having a TV show, rubbing shoulders with important people etc. I was a little famous back then as a model and when word got out that I was contesting, many of the soft sell magazines reported it. About a week before the pageant, I was so sure I would win it that I started making plans for life after being crowned Miss Nigeria 2003. Most of the models and designers in Nigeria were behind me, even the press, so what could go wrong? Plus I’d organized the Miss Unilag pageant for 3 consecutive years so I knew what it took to win a pageant..or so I thought! And then the day of the pageant came. After all the 26 contestants were introduced on stage in different costumes, it was time for the Top 10. We were all asked to go backstage so they could call out the 10 girls who had advanced to the next stage. I remember standing backstage with a huge smile on my face waiting for my number to be called. It was never called. At first I thought it was a prank, that the organisers were just playing with me. That they would say a mistake was made and my number was omitted, and ask me to come join the other girls on stage. Then I heard the MC say ‘ladies and gentlemen, these are your Top 10 contestants’. Then I saw all the other contestants who didn’t make it taking off their jewelries and costumes. Some started crying, others were hugging each other but I didn’t move. I couldn’t believe it. Even if I didn’t win the pageant, but not to even make Top 10? I was just standing there, unable to move…until a male model friend of mine came to hug me and told me ‘all will be well’. As I slowly started removing my costume, I remember thinking it was the end of everything I had planned for my future. I felt like a failure for weeks following the pageant. I was mostly in a daze, wondering what to do next. I’d thought being Miss Nigeria was the best thing that could happen to me. And that dream was gone, and with it, all the great things I could have done or become. But you see people, I forgot for one moment, that there was God. If only I knew that He had better plans for my future. Because you see, if I had won that pageant in 2003, I never would have – 3 years later – thought of starting a gossip blog. I probably would have thought it was beneath me as a former queen. My life would have taken a different turn…but that wasn’t God’s plans for me. So that disappointment was a huge blessing! You see, sometimes, some of the most amazing blessings happen when things don’t turn out the way we hoped it would. We think it’s the end when it’s just a bend leading us through the right path, to where we are really meant to be. You have to trust that God knows what He’s doing in your life. Sometimes, He will not give you what you desperately want because He has planned something way better for you. So when disappointments happen in your life, don’t worry too much about it. Just trust God, stay patient and trust your journey.